Many people who have used my books "Mandolin Master Class" and "Mandolin Training Camp" have asked whether I have a beginning mandolin course which approaches learning in the same manner. 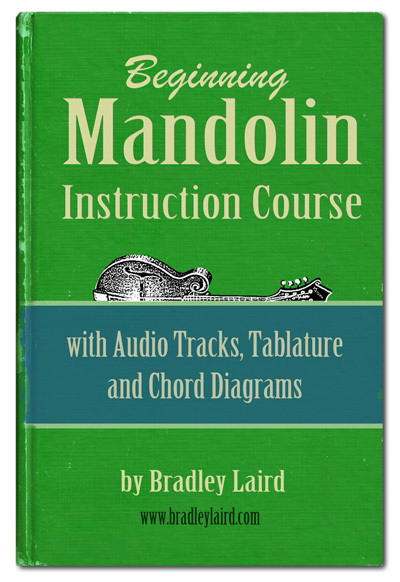 I wrote this course for my own students because I was not completely happy with the beginning mandolin books that were available. One of the best features of this course are the embedded audio tracks which allow you to hear the notes and rhythm of every exercise and song in the book! All of the audio demonstration tracks are also supplied as MP3 tracks so that you can add them to you iTunes or any MP3 player. The lessons are organized to teach you the basics in such a way that you get the skills and information you'll need to advance towards becoming a good player. In addition to learning tunes and chords, this instruction course is designed to teach you to play the instrument, not just how to pick a few tunes. I also include a special set of beginner chop chords designed to be playable by people with small hands. These "small hands" chords are not the two finger chords you may already know, but are compact chord shapes which span a smaller number of frets and can be moved all over the neck. If you have had trouble with the "big chop chords" you'll really appreciate these! As you learn to play the songs and exercises you'll also get a lot of additional information about scales, playing in other keys, and how to practice effectively so that you make real progress. The course also includes a tuning track and 3 metronome tracks. 43 pages, 8.5" x 11", Printable PDF file format with 36 MP3 audio tracks.